The Smiths Barb is one of Thailand’s smaller Barb or carp species which is widely distributed throughout South East Asia including the Malay peninsula that favours submerged vegetation such as rafts of underwater weed in slow sluggish rivers, streams and lakes where it subsists on a diet of vegetable and plant matter and possibly small insects and invertebrates. The Smiths Barb has a scale covered body displaying a silver to grey colouration in its dorsal region with grey or sometimes orange pelvic, caudal and dorsal fins. 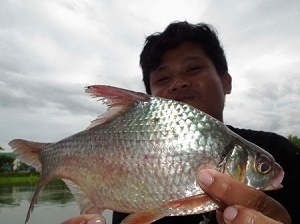 This Thai Carp species has been recorded at weights to 2kg’s and can be found in Srinakarin Dam and Khao Laem Dam in Kanchanburi in addition to fishing lakes such as Bungsamran and Palm Tree.